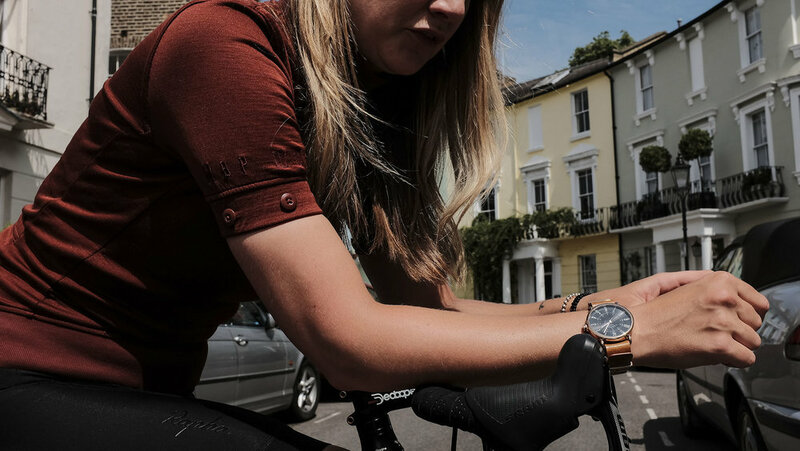 When cycling obsessive and artist Kitty Pemberton-Platt came together with the London-based Camden Watch Company, she decided to do it differently, with her mission to provide pared-back simplicity and clever stylistic elements that nod to the passion of cycling. Like a Brooks saddle or Carradice bag, the result is a timepiece that will get better with age. We talk to KPP to find out more about the creative process. Something that hasn't changed in cycling is a commitment to detail, so we spent a lot of time looking at the details cyclists old or new can relate to. From the handlebar-inspired strap to the spoke pattern on the dial, the result is a watch that's full of considered details that are inspired by the pastime we all love. When it came to the design process, you quickly learn that the skill isn't in adding more, it's knowing what to take away. Just like riding, the smallest change can make the biggest difference. What are the details you are most proud of? Seeing the CMDN X KPP logo on the side is a feel-good moment every time I put the watch on. It signifies more than the watch - it represents a journey with the sport, with great people and also my time in London. I also feel hugely proud every time someone sends me a picture of the box or them wearing it. A lot of designers say it, but to see all the hard work and heart being enjoyed by someone (whether they are a cyclist or not) is a truly wonderful feeling. The morning. Waking up early means you have more of the world to yourself. It's the start of something. It's that first coffee. It's getting up and out before your head becomes busy and unforgiving for the rest of the day. Most memorable time on the bike? Each ride has taught me something about the bike, life or myself. And that’s equally true for the amazing and horrible ones. The beauty of time on the bike is that you are hyper aware, your emotions are heightened and whoever you are with will be more open. Those moments become addictive and make memorable times on the bike endless.